Galimulator 3.0 introduces the idea of people (or whatever they may be) inhabiting the galaxy. Specifically, it introduces people who hold Jobs, and are part of Dynasties. These people have an impact on what their employers do, and how they perform. For instance, if a person with the "Mutineer" trait is the Captain of a ship, that ship may just rebel to go on a wild spree. Or, if a person with the "Mechanic" trait is made captain of a ship, that ship will regenerate more quickly. Or, if an Emperor is "Bright", they may advance in tech more easily, etc. Backstab : Tries to have coworkers killed. Maybe in order to climb the ranks, maybe not. Additional traits may be gained over time. Each of those categories have a corresponding icon which shows up in the game, to help you see just where your people are working. Each employer also has some jobs associated with it. Each job has a level, ranging from level 1 (like a Fighter Pilor or a local Bureaucrat), all the way up to level 5 - which is Emperor. You can see each jobs offered by every employer. For empires, just tap on any star and then tap the "Employees" button. For stars, tap on that star, then tap again on the "Star" button to find the "Employees" button. You can also find any artifacts on that star in that view, and tapping on that artifact in the list will show you the jobs on that artifact. For ships, simply tap the ship, and then tap "Employees". As jobs become available, the positions are open to anyone who currenly has a job with a level that is one step lower on the ladder. So for instance only 4 star employees, such as ministers, can apply for an Emperor job. But, it is open to all, not only people already working in that empire. This prestige level is an indication of how much experience this person has, and how highly regarded he or she is. Prestige is a very important aspect of getting new jobs. People can die for various reasons. For instance, if they are working on a ship, and that ship is destroyed, that person will die. The same thing happens if they are Emperors, and the empire they are leading is defeated. The conquerors will not be very interested in keeping the old leadership around. People working on stars may suffer the same fate if their stars are conquered, though they do have a decent chance of surviving. Each job also carries with it an inherent risk. It's pretty safe to be a paper pusher, but ministers have more enemies, and may be taken out by other means. Congratulations - it's a Bureaucrat! As new entry level positions need to be filled, new people are born into the world. They are always a combination of two parents. But at least for now, parenting, monogamy, etc, these things are not very important for the galactiv power elite. So currently there is no way to track actual birthlines of people. They do have parents though, and they are usually close to where the new position opens up. People are either born into existing families, or they may choose to start a new one. Families are simply groups of people. They all share the same name, some common ancestor and tend to help each other out during the game. They also all have a randomly generated flag. They may or may not be good looking (both the flags and the people). You can press the Dynasty button in the sidebar view to see a list of the top families currently in the game. From there on, you can tap individual family members to see what they have been up to, and follow their future progress. You can also go directly from viewing a person to viewing their dynasty, simply by tapping on their flag. You can also choose to follow a family, which puts little flags on the map to indicate where they are working (imperial jobs are stationed in the imperial capital). It can be quite fun to track as families spread, by ships, or promotions, across the galaxy. Each family also has a prestige level, which is built up over time by the prestige of the family members. If high prestige family members are lost, then over time the prestige level of that family will drop. 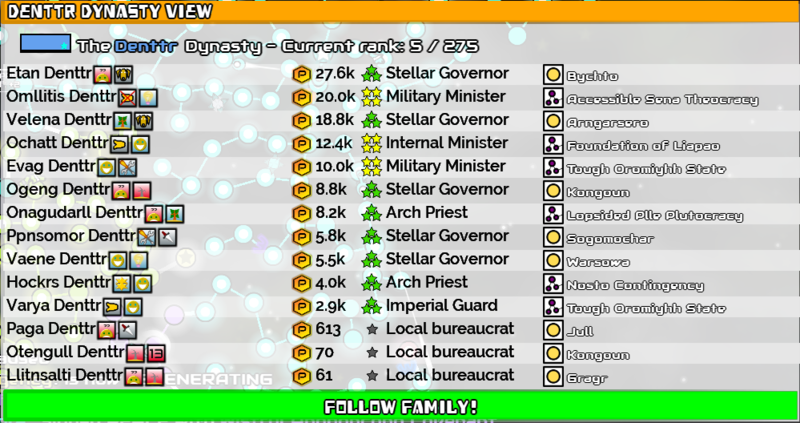 From the family view, you can also see which prestige rank this family holds compared to other dynasties in the galaxy. Families are limited in size to 20 people at any given time.